Marty Smyth has been patient since returning from the break, waiting for his chance to either steal blinds or double up. However that patience finally paid off when he moves allin for 22k on the button. After the big blind takes a minute to think he calls and shows his 10-10, just as Marty Smyth turns over his Jacks. The board comes Q-4-8-3-8. Marty Smith doubles up to 46k. 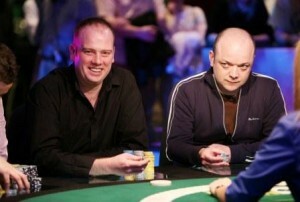 Still small stack, but if any man knows how to win a tournament from a few big blinds Marty Smyth is that man. This entry was posted on Sunday, October 25th, 2009 at 4:18 pm and is filed under Poker News. You can follow any responses to this entry through the RSS 2.0 feed. You can leave a response, or trackback from your own site.